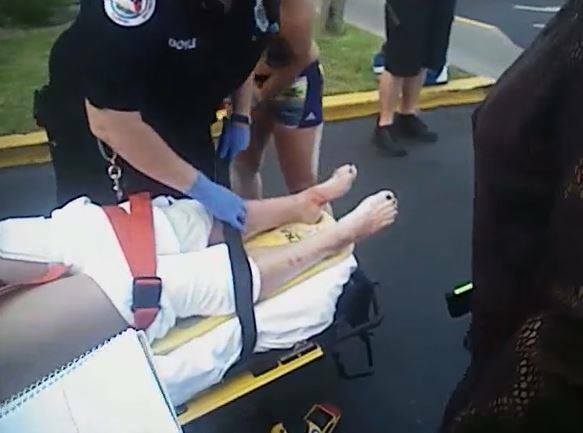 DESTIN, Florida - A Kentucky teen visiting Florida to play in a softball tournament was bitten by a shark while swimming in the Gulf of Mexico off of the Florida Panhandle on Monday afternoon. 17-year-old Caitlyn Taylor, of Louisville, Kentucky, was in waist deep water off of Destin, Florida around 3:39 p.m. when she saw the shark in a wave heading towards her - but she initially thought it was a dolphin. The teen told the Okaloosa County Sheriff's Office that the shark took her by the legs and tugged on her. While the shark was biting her, Taylor was able to punch the shark before the shark turned her loose. The girl suffered six puncture wounds to her right leg near her knee and was transported to the Destin Emergency Room where she received eighty stitches. She also had scrape wounds on her left leg. Witnesses estimated that the shark was five feet long but were unable to identify the shark's species. Although Okaloosa County has only had four recorded shark attacks in over 100 years, Florida has had a recent increase in unprovoked shark attacks. In 2016, the Sunshine State accounted for 60.4% of all shark attacks in the U.S. and 39.5% of the world’s total, according to the University of Florida International Shark Attack File.